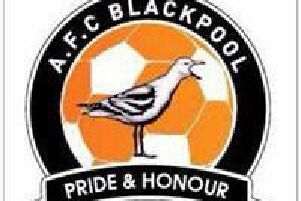 Two goals in the final five minutes sealed victory and made it seven points out of nine for Blackpool in 2019 in the Hallmark Security League . It was a third win in six games for manager Martin Baird, who named five of his recent signings in the starting line-up. Jamie Milligan’s through ball found Ryan White on 37 minutes and his shot rebounded off a post with the keeper beaten. Then as half-time beckoned, Jack Webster shot over form Ben Duffield’s lay-off. The east Lancashire side made the better start to the second half, though it was Blackpool who opened the scoring on the hour through White’s shot from the edge of the box. Darwen pressed for an equaliser and were denied by Alex Cameron’s good save on 70 minutes. They did draw level when Daniel Taylor struck 10 minutes from time but Blackpool came back all the stronger. White went through one-on-one with the keeper only to hit the woodwork for a second time, then had a penalty appeal turned down when challenged by a Darwen defender. But with five minutes remaining, Milligan’s free-kick from just outside the penalty box was headed home by defender Jake Darnell, his second goal in successive games. And victory was secured three minutes later, when another Milligan free-kick resulted in a goalmouth scramble which saw Tom Preston fire home. Blackpool remain 14th in first division north but will welcome leaders Longridge Town to the Mechanics Ground on Saturday in high spirits.